We've noticed that we have had our snuffly little visitors back in the garden. Each year they return and we start to notice obvious signs of their nightly escapades through our garden. The large droppings and the dipped grass under the fence on either side of the garden. The girls have spotted hedgehogs during the daytime too, which we have since found out that they shouldn't be seen during the day, they are nocturnal animals and usual forage from dusk till dawn. If you see one during the day that is an alert hedgehog and appears to be moving "normally" may be a pregnant hedgehog who is gathering nesting materials. These are best left alone. If they are flat out, wobbly or injured then you need to call for assistance. Follow the link for more information. 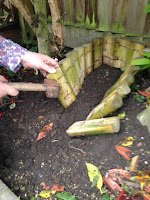 The girls have been wanting to build a hedgehog hotel for a while after reading about them on the RSPB website when we became members. And what better time than during the half term break. So I set them the task to research what we needed to do. This also goes towards earning their Wildlife Explorers badge at Brownies so they had to do the hard work! Firstly we needed to find the ideal location, we found a clearing in our flowerbed which is near to one of the entrance dips under the fence that the hedgehogs tend to use so this seemed ideal. It needs to be shaded and the hedgehog hotel entrance should be out of direct wind. Once we had decided on this I set the girls to work in clearing the soil or debris. I had already acquired an old terracotta roof tile which would be ideal for providing a water proof shelter to the hotel. I laid this in the clearing and pushed it down firmly to mark out the rough dimensions. Then lifted this away and used a small gardening shovel to dig out shallow trenches. Then we used log roll for the sides and back. Once I had cut this to size,making sure the ends of the wire had been safely hammered flat, the girls pushed it into place in the trenches. Then using as heavy mallet I knocked it securely into place. I left two extra log pieces to cover most of the front and then Emily lifted the roof tile into place. This sat nice and heavily on the top. Then the girls placed a short piece of tubing into place to act as the entrance tunnel. This left a gap across the top so I cut another small piece of log roll and sat this over the gap, This is a temporary filling until I get something better but it does the job needed. We then pushed the soil around the sides of the piping to hold it snugly and Mollie added an arch of log roll over the piping to disguise it. We now needed to add some dry leaves and hay to the bottom of the Hedgehog Hotel, this is easy to access due to being able to simply lift the tile off. Once these were in place the hotel was snug and ready for its visitors. It's really important not to disturb the hedgehogs and fingers crossed we will soon have residents and maybe even hoglets! Usual activity will take place in late Summer-early Autumn. Recommended food is wet cat/dog food or whole cat biscuits and only water to drink. However, if the hedgehogs are healthy then they are able to forage for their own food so additional should not be necessary. Here are some pictures we have taken recently of our little visitors, as you can see in the central photo this little hedgehog has curled himself up close to the location we chose for the Hedgehog Hotel. We left a leaf laying across the inside of the piping and if this gets disturbed it will give us a clue as to whether a hedgehog has stayed for a snooze. We'll keep you updated if we have any visitors!